Former Maine Governor John McKernan addresses members and invitees of a luncheon for Republicans Committed to Higher Education in Minneapolis, MN during the Republican National Convention in 2008. Lawyers for Education Management Corp., a for-profit college company that until recently was run by former Maine Gov. John McKernan, on Wednesday filed a response to a federal whistle-blower lawsuit, asking the court to dismiss the suit. The lawsuit, which the Justice Department joined in May, alleges that Pittsburgh-based Education Management illegally paid recruiters based on the number of students they enrolled. The government, in most cases, forbids such incentive compensation for colleges accepting federal aid because of concern the practice will encourage companies to enroll unqualified students. On Wednesday, Bonnie Campbell, an adviser to the company’s legal team, asserted that its method for compensating recruiters fell squarely into the confines established by the law. “EDMC believes that the case should be dismissed with prejudice because the government’s False Claims Act and common law claims are legally flawed and factually insufficient,” Campbell said in a statement. Lawyers for the company argued in their filing that its pay structure for recruiters adhered to federal law because it did not solely rely on the number of students enrolled to determine compensation. 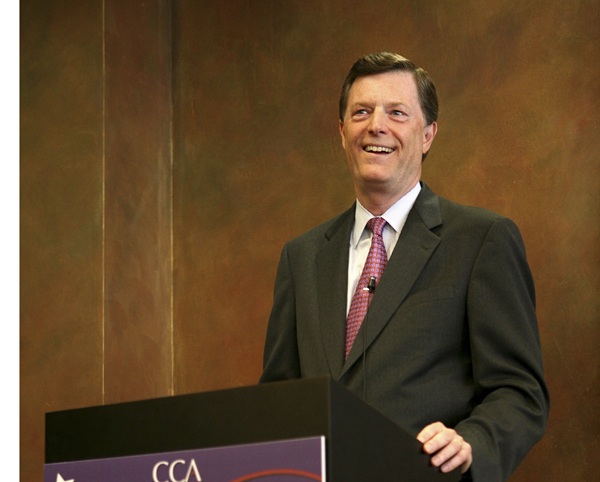 McKernan, the chairman of the board, was CEO of the company from September 2003 until 2007. He first joined the company in 1999 as vice chairman and a member of the board, according to the company. McKernan, 62, was the governor of Maine from 1987 until 1995 and was one of the state’s congressmen from 1983 to 1987. He is the husband of Sen. Olympia Snowe, R-Maine, and remains an active part of Republican politics in Maine. McKernan is not named individually as a defendant in the lawsuit. Education Management Corp., which enrolls more than 148,000 students, operates the Art Institute chain, Argosy University, Brown Mackie College and South University. A for-profit college differs from a traditional college or university in that it is operated by a private business. For-profit colleges serve about 9 percent of the higher education population. The Education Department in July made all incentive compensation for college recruiters illegal, removing 12 types of exemptions, or “safe harbors,” that were put into place in 2002 under President George W. Bush. The exceptions allowed the practice when recruiters weren’t paid solely on the basis of enrollments. EDMC’s pay plan for admissions representatives in July 2003 was designed to comply with the safe harbors, which was still in effect. “Although the government may now disfavor the Safe Harbor regulation — as evident by the fact that it repealed the regulation, effective July 1, 2011 — this cannot change the fact that the regulation during the timeframe covered by this lawsuit unambiguously permitted the consideration of enrollments in setting [recruiter] salaries,” lawyers wrote in Wednesday’s filing. Harry Litman, the plaintiff’s attorney in this case, filed the whistle-blower complaint four years ago. As is the norm in these cases, it was sealed as the government began to investigate the allegations. While McKernan is not named as a separate defendant in the suit, his name does appear in the body of the lawsuit. In the lawsuit, the plaintiffs note that in order for the company’s colleges to be eligible to participate in student loan programs, the schools entered into “program participation agreements,” or PPAs, in which they assert they would obey the incentive compensation ban. In looking at the two whistleblowers in the case, lawyers for the company dismissed them as having scant knowledge of how the company established pay for recruiters. “The government relies exclusively on two isolated, low-level employees with virtually no relevant knowledge, and the allegations in the complaint are contradicted by what little knowledge the relators purport to have, the government’s own exhibits, or both,” company lawyers wrote.